A missing scene for The Nuisance episode during the time between Dr. Early and Dr. Morton operating on Johnny and his being transferred to a regular room sitting up in bed watching a soap opera. They don't belong to me, and I'm not getting paid. But I love to write about them, so I hope Universal and Mark VII will let me borrow them for a little story telling. Sitting in the lounge with the lights dimmed, sipping lukewarm coffee, he waited for word. He'd been there for hours. Much longer than he was supposed to be, but nothing could make him leave until he knew for sure that everything had been done to help his friend. He was exhausted and the stress of the situation still hung heavily on his shoulders. The door opened letting the harsh lights from the Emergency Room hallway into the darkened room. He squinted at the bright intrusion. A shadowy figure moved inside the room and let the door close effectively blocking out the brilliant light. "You still here? I thought you went home hours ago." The sound of pouring liquid into porcelain echoed through the quiet. "Just waiting for him to wake up from the anesthesia. Wanted to be sure everything was okay." A sipping noise, then a soft cough, "Ugh, this stuff is almost cold." The porcelain clanked down on the table. "Well they called from recovery a few minutes ago. He's waking up now. Come on. I'll go up with you." The two doctors left two cups of lukewarm coffee sitting on the table in the darkened room. They walked wordlessly to the elevator and waited. The elevator seemed to take forever to open. A crowd of people exited into the ER lobby blocking entrance to those waiting. The doors began to slide shut when a hand reached out and stopped their progress. One doctor entered the car and pushed the open door button while the other waited as the other waiting passengers boarded. Then he too entered, and together they all watched the doors close. The piped in music played an eerie tune. All eyes stared at the numbers above the doors. Everyone stood very still like they were afraid of bumping the stranger standing next to them. The elevator progressed slowly from floor to floor stopping on each to let people out. Others boarded and the doors closed once again. Finally, the car stopped on the ICU floor and the two physicians exited. They approached the nurse's desk and wondered where everyone was at. The desk stood empty. "Kind of unusual for no one to be here. Isn't someone supposed to be watching the monitors constantly." "Yes, must be a problem with one of the patients." A nurse rushed from one of the ICU cubicles and hurried to the desk. "Oh hello, Dr. Early…Dr. Morton. We've just gotten Mr. Gage settled in his room. He's been pretty agitated and nauseous since they brought him down from surgery." She breathlessly explained. "We just got him cleaned up again." Joe looked at Mike and nodded his head. "I was afraid of this. He doesn't handle sedatives or anesthesia well. We better add something for nausea to the list of medications." "Let's go check out our boy." Joe moved toward Johnny's room. Mike followed. The two men entered the cubicle to find Johnny moving around in his bed. His hands rose up and pulled weakly at the restraints the nurses had been forced to use in order to keep him from pulling out his IV's. His head rolled weakly from side to side, and he was moaning softly with each turn of his head. Joe walked over to the side of the bed and placed a hand on Johnny's shoulder. "Johnny." He got no initial response. The soft moaning continued as did the constant turning of his head. Joe tried again. "Johnny, can you hear me? It's time to wake up now." Johnny's head stopped turning and he seemed to be looking at Joe, only his eyes remained closed. Then his face wrinkled and his mouth opened. He licked his lips and swallowed convulsively. "I better get that medication started." Mike smiled at Joe. "Before we both need new shoes." Joe brushed the damp hair from Johnny's forehead in a gesture similar to one Dixie would use if she were there. She was out of town for the weekend. If she had known Johnny had been hit by a car while on duty, she would have returned immediately from her long weekend adventure. Joe didn't tell her when she called earlier to let him know she would be back on Monday. She was already cutting her trip short by a day since Carol's mother had fallen ill. No, she would find out about Johnny soon enough. By then he hoped Johnny would be more alert and on the way to recovery. He hoped. Mike administered the medication and made notes on the chart. "Come on Joe, he's in good hands now. His vitals are good considering all the trauma. I'll come back up in a couple of hours and check on him. If there's any change I'll give you a call." Joe sighed. "I think I'll sit with him for a few minutes." He pulled the plastic chair over beside the bed and lowered himself wearily into it. "You've been here too long already." Mike tried again to reason with his colleague. "There's nothing more you can do for him right now. You should go home." "Roy would be here if he hadn't had to go back on duty. I'll just sit with him for a little while." Joe folded his arms over his chest indicating his intent to stay. "Roy doesn't like for him to be alone." 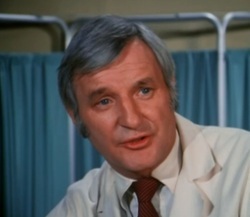 Mike smiled at the older doctor. "Okay. I give up." He held up his hands in surrender. "I have to get back downstairs. Kel won't be happy if I let his ER get out of control while he's at that conference." He chuckled. "He's already going to be beside himself that neither he nor Dixie was here when they brought Gage in." "Yeah, you're probably right. But he knows already." Joe yawned and rubbed his hand over his eyes. Mike's eyebrow went up in question. "You did?" "Well I needed his professional input. I…" He hesitated. He was a little embarrassed by his unease at treating a patient. "I was worried about the internal hemorrhage." He sighed. "I mean I knew what had to be done. I knew if we found damage we would have to extricate, but what if had been one of his kidneys? That would have changed his life forever. I just needed someone to tell me what to do." "While I changed into my surgery scrubs, I called him. It only took a few minutes. He's flying in first thing in the morning. He was really shocked." Joe looked over at Johnny and huffed out a strained laugh. "So was I." Mike moved beside his friend. "Me too Joe, me too." He gripped Joe's shoulder and squeezed it in support. "But you did a good job, and now it's up to him." "Yeah. Thanks Mike. I couldn't have done it without your help or Roy's for that matter. If he hadn't gotten him in here so fast..." Joe shuddered at the thought. "Mike Morton to the ER. Dr. Morton to the ER. STAT"
"Well they're playing my song." Mike patted Joe's shoulder and hurried out the door. Joe crossed his leg resting his ankle on his knee and settled into the very uncomfortable chair. 'How does Roy sit in one of these things for so long?' He shifted trying unsuccessfully to get more comfortable. Johnny moaned softly. Joe looked over at him to be sure he settled again. "I remember the first time I met you my friend. You were just a boot. You were so young." Joe chuckled at the thought of a very tall thin young man who came into the ER after diving into some very nasty water to rescue another new recruit from drowning after the two of them had been thrown from an explosion. "You were saving people on your first shift, and you've been doing it ever since." "Uhnn." Johnny moaned almost as if he were answering Joe. Joe eased out of the hard chair and pulled the chart from the end of the bed. He wondered when it would be time for Johnny's next dose of pain meds. He and Dr. Brackett had pulled Johnny through some pretty tough scrapes over the years, but never had he had to have major surgery. Broken bones, snake bite, exposure to radiation, a monkey virus, cuts, bruises, smoke inhalation and pneumonia more times than he could count, but this…this was hard to deal with, even for a doctor. "Okay, my friend…I'll be right back. I think we can get you a little something to ease your pain." He left the cubicle and shuffled tiredly over to the nurse's desk to request the medication. After giving instructions to the nurse, Dr. Early decided he needed some more coffee. He didn't plan on leaving the hospital until Johnny was awake and oriented. Of course with more pain meds that could take a while. When he returned to the dreaded chair he had a fresh cup of steaming hot coffee. "Well Johnny, I know you would enjoy this coffee. I made it myself…just the way you taught me. I swear for a guy who never drank the stuff until he became a fireman, you sure know how to make a good strong pot without any bitterness." He thought back to the first time he saw Johnny drink coffee. It was after he came in all wet and chilled from pulling the other boot out of the water. Johnny was soaked to the bone, but no one realized it. He had put his turnout coat on over the wet clothes and fallen asleep in the waiting area. The nurses didn't realize he needed treatment. Johnny was so shy at the time he never spoke up. Just curled up and went to sleep until Tony Freeman went looking for him. They'd had to force him to drink some coffee to warm his insides. He took one sip, his face wrinkled with distaste, and he'd asked if he could have warm milk instead. A nurse came into the room disturbing Joe's thoughts. She walked quietly over to the bed and lifted Johnny's wrist to take his pulse. "We don't usually see doctors sitting with their patients." She smiled over at him. "He's a friend." Joe shrugged. "I've known him a long time." "Isn't he one of the paramedics?" She asked quietly. "One of the first." Joe looked over at Johnny and smiled. "And one of the best." "I heard he was hit by a drunk driver." She lowered his arm back to the bed and checked the IV drip. "He was on a call. The driver didn't even stop, just sped off." "Oh that's terrible. Is he going to be able to return to his job? It would be a shame if he couldn't." She checked the Foley collection bag hanging on the side of the bed. "I think so. He's healthy and strong." Joe watched her making her night time checks. She was good at her job. "Didn't you have to remove his spleen?" "Won't that leave him susceptible to germs? A paramedic is a first responder. They never know what type of illness they will be treating. Won't that be dangerous for him?" She stopped and looked at Joe for his answer. "It could be, but if I know John Gage like I think I do, that won't stop him from returning to the job." Having said that out loud lifted Joe's spirits. He did know John Gage and nothing short of losing a limb would stop him from returning to his job as a fire fighter/paramedic. And if he could figure out how to continue without that limb he would do that too. Johnny was very driven when it came to fighting fires and saving the victims. He also took it very hard when his patients didn't survive. "I remember right before he signed up for the paramedic program. He was a rescue man out of LA County Fire Station 10. He and his partner Tony brought in an electrocution victim. They had got him here alive, but things turned sour very quickly, and he didn't make it. Johnny didn't like those odds. The next thing I know Dr. Brackett, Dixie and I are teaching the first paramedic class ever held at Rampart. That seems like a life time ago. Johnny finished at the top of that class. He and Roy Desoto were the first to practice in the field when The Wedsworth Townsend Act passed. It'll take more than losing his spleen to stop him from continuing as a paramedic." "Doc?" Johnny whispered from the bed. "Wha'…'appened?" He slurred. Joe stood up and quickly stepped beside the bed. He placed a reassuring hand on Johnny's shoulder. "It's okay Johnny. You're at Rampart. Do you remember what happened?" Johnny looked up at Dr. Early's kind eyes and smiled. "Juz like ol timez," he whispered. Joe smiled back at his young friend. "Yeah." "Yes, you were hit by a car." "Roy?" A panicked expression crossed Johnny's features. "He's fine. He's back at the station finishing your shift." "I know. We just gave you something for pain a little while ago. You should be feeling better soon." He patted Johnny's shoulder softly. "Bad?" Johnny was struggling to stay awake. Joe knew how stubborn Johnny could be, and he was expert at fighting sleep. "You've just had surgery. We had to take out your spleen." He waited giving Johnny a little time for that to soak in before continuing. "You have a clean fracture of your leg and more cuts and bruises than I can tell you about." Joe could see the worry in Johnny's expressive eyes. "No nothing else, just the spleen." "K." Johnny let go and gave in to sleep once Joe told him about his injuries. "He should rest now. You look exhausted. Maybe you should go on home now." The nurse suggested to Joe. "Oh I will, but right now I think I'll just hang around here a little longer. He usually has to be reminded several times before he really remembers what we told him." He smiled fondly. "Well I have to finish my rounds. At least it looks like he isn't nauseous anymore." She smiled. "Oh he will be if we don't keep up with that medicine for a little while. There are two things you can count on with Johnny Gage. One is that he absolutely hates needles, and the other is that he will be sick for at least twenty four hours after being under sedation or anesthesia." He returned to the stiff hardback chair as the nurse slipped out of the cubicle to continue her nightly duties. Before long Joe was dozing lightly. His head hung down with his chin resting on his chest. That's how he was when Roy stopped by after delivering a patient to Dr. Morton. "Doc." Roy shook Dr. Early lightly. Joe's eyes opened. He blinked several times and looked up at Roy. "Hi." "Hey Doc. How's he doing?" Roy waved his arm over toward the patient. "He woke up earlier. We talked. I told him about his spleen." Joe yawned. "He won't remember though." "What are you still doing here?" Roy looked at the older man with concern. "Has something else happened?" Joe smiled at the way both men looked out for the other. "No…no Roy…nothing else has happened." Roy wrinkled his forehead in wonder. "Then you should probably head on home. Get some sleep yourself." Roy chuckled. "I know…better than you think." Joe chuckled too. "I didn't want him to wake up alone. You had to go back to work, Dixie's out of town and…well…"
"He grows on you doesn't he?" "He'll bounce back again." Roy sounded confident. "He will, but it won't be as easy this time." "No…no I guess it won't, but that won't stop him." Roy stood up taller, pride shown in his eyes. "It'll take more than a speeding sports car to stop him from fighting fires and saving victims." "Go home Joe." Roy patted the doctor on the back. "I will. I want to make sure we keep the nausea under control. Make sure he doesn't spike a fever. You know how he likes to keep us on our toes." Joe yawned again. "He really had you worried this time." Roy looked over at Johnny again. "He had you worried too." Joe smiled at Roy. "Yeah, really did it this time." Roy ran his hand through his hair. "Listen Doc, I gotta go. Dwyer is waiting downstairs. Tell Johnny I'll be back as soon as I get off shift. Okay?" Just as Roy turned to leave Johnny stirred again, his arms pulled weakly at the restraints. Roy looked at Joe. "Why is he tied to the bed?" "He's been restless and sick. We didn't want him to pull out his IV. We'll have them off before he's awake enough to remember." "He won't know. He won't remember." Joe assured Roy. "I'm tryin' sl..sleep." Johnny murmured from the bed. "Yes partner, it's me." Roy smiled at Dr. Early. He was glad Johnny seemed to recognize him. "How are you feeling?" "Feeling?" Johnny's eyes struggled to open. "Hanging on…both hands." Roy's smile grew bigger. "Good." He turned to Dr. Early, "I told him to hang on before you took him to surgery. He told me he would, with both hands." Johnny drifted back to sleep, his hands no longer pulling on the restraints. "Well Doc. I'll be seeing ya." Roy turned to leave. "I've gotta get back." "Okay Roy, you boys stay safe out there." Joe returned to his bedside vigil. A few hours later the sun had come up, but in the ICU cubicles there were no windows. Dr. Early slept in the chair beside Johnny's bed without knowing it was morning. Dr. Kelly Brackett slipped into the room and lifted the chart from the end of the bed. "Hey Doc." Johnny whispered from the bed. "Hey yourself. How are you feeling this morning?" "Like I was hit by a car." Johnny smiled. "Funny thing is my wrists are kind of sore. I must have landed on my hands." He held his hands up looking at his wrists. "Well, let me see what it says in your chart. How long has he been here?" He leaned his head toward Joe. "All night I guess. I don't remember." Johnny yawned deeply and his eyes closed slowly. Dr. Brackett put the chart back in place and walked up beside the bed. "Mind if I take a look at your incision?" "It'll only take a minute; then you can go back to sleep." "K." Johnny's eyes were already closed again. "How does he look?" Mike Morton asked from the doorway. "Johnny or Joe?" Kel joked. "Ha ha ha." Joe said through a big yawn. "When did you get back?" "Just now. You should be at home in bed." "Yeah, yeah, yeah, I've heard that one before. I've even told you that a few times, if I remember correctly." Joe volleyed back at the head of his department. "This is a nice bit of handy work." He replaced the bandage. "You guys did good." "It was Joe's handy work. I just assisted." Mike responded still leaning against the door frame. It had been a long night down in the ER, and he was tired. "I'm heading home. Joe do you need a lift?" "I should ask you the same thing, Mike. I'm the one who had a nap." He yawned again stretching. "From where I'm standing, I think you both should just go down and sack out in the dorm." "Too many young interns." Morton grumbled. "And they snore." Joe chimed in. "Now that you're here to keep an eye on our friend I think I'll go on home." "He really had you worried this time." "He did." Joe agreed with Kel. "He seems to be doing okay now though." "He would be if some people would stop talking so much." Johnny admonished from the bed. His eyes open and looking at the three doctors. "I thought the ICU was supposed to be a quiet place." All three doctors burst out laughing. "I think you may be ready for a step down room." Dr. Brackett smiled. "Really?" Johnny grinned. "That's great!" He tried to raise up on his elbows only to fall back against the pillow with a groan. The movement pulled at his stitches. "Well let's not get ahead of ourselves. I'll need to run a couple of tests, but we'll see." Kel pulled the covers back up over the surgery site and patted Johnny on the shoulder. "I'm glad you're doing better." "Me too." Roy said from behind Mike making the young doctor jump. He stepped aside to let Roy enter the room. "Hey Partner." Johnny called out in greeting, but this time he didn't try to move. "They're moving me to a step down room." "Now wait just a minute hose jockey. I said we would have to see about that after we run a few tests." Dr. Brackett corrected Johnny. "Yeah well, I'm doing great, so bring on those tests." Johnny folded his hands over his chest and grinned broadly. And as if on cue he coughed at least three times. "Man where did that come from?" The other men in the room simply groaned. Roy settled in the hard plastic chair for a visit as the three physicians made their leave. The doctors stopped at the nurse's desk to order tests and X-rays before heading back down to the ER for Dr. Brackett and home for Dr. Early and Dr. Morton. Dr. Brackett was called into a treatment room as they departed the elevator. "I'll see you two later." He hurried off down the hall. Mike headed out to his car and Joe went to his office to get his car keys. After a busy morning in the ER, Kel finally had time to stop for a cup of coffee. When he entered his office he found Joe Early sitting on the sofa looking at a medical journal. "Joe, what are you still doing here? I thought you left hours ago." "I was…I mean I meant to…but…" Joe said softly. "Something bothering you?" Kel perched on the corner of his desk. "No…Yes…I guess." The ever calm Joe Early clearly did not have control of his normally together self. As a matter of fact he sounded a bit like a nervous Johnny Gage. "I mean, Johnny, I've known him a long time. He…what if…" He ran his hand over his face. "Kel, I almost lost it when they brought him in. What if I had?" "Listen Joe, I've treated Johnny many times when he's been injured, Roy too and countless other firemen and paramedics. You have too. You pulled us both through that Monkey Virus. Why was this any different?" "He was critical when they brought him in. He was bleeding out. We almost lost him." Joe looked at his hands. "We almost lost him with that virus and the snakebite." "The virus was different. You treated him for the snakebite. I've known John Gage since he was nineteen years old and just a boot. I watched him become a rescue man and then a paramedic. It's who he is. What if I had been forced to remove a kidney? That would have ended his career. Hell, Kel that would have ended his life as he knows it. What would have happened to him then?" Joe stood up and paced back and forth in front of the sofa. "Joe, John Gage is one of the most resilient men I know. He has bounced back from everything that has crossed his path. He would have bounced back from that too. He would have become an instructor or something. The Fire Department would have allowed him to become a dispatcher, or knowing Johnny a spokesperson. He would have found a way to continue with the department. We could use him here to teach new paramedics and EMTs. You know that." Dr. Brackett moved behind his desk and sat down in his chair. "It's a risk they signed on for. It's a chance that they take willingly. That's what makes them so special." Dr. Early slid back down onto the sofa. "Yeah, I guess. He's overcome a lot in his life to get where he is today. I hope I never have to be the one treating him when something happens that he can't recover from completely." "He won't recover from this completely." Dr. Brackett sighed. Joe's eyes shot up and his mouth fell open. "What do you mean?" "His spleen." Dr. Brackett leaned back in his chair. "He's already susceptible to pneumonia. Now he'll have to work even harder to stay healthy. We'll have to make sure he gets on antibiotics if he's exposed to anything contagious in the field." Joe sunk back on the sofa. "I guess you're right." "You see Joe, you already treated him for something he will never recover from, but…" He hesitated to be sure Joe was listening. "But, you pulled him through, and you will be here every step of the way to see him through any complications. That's what makes you so good at what you do." The two friends sat together in contemplative reflection. Kel watched as a mixture of emotions streamed across his colleague's face. After a few minutes Joe seemed to relax a bit. "You know Kel, the first time I ever met Johnny I knew there was something special about him. Now I know what it was." There was a silence that followed Joe's statement. "Well, aren't you going to share?" Dr. Brackett leaned forward and rested his elbows on his desk. "What is it, about the most stubborn, bull headed, strong willed, aggravating young paramedic I've had the pleasure of meeting that is so special?" "Well that Gage charm of course." Joe chuckled as he rose from the sofa. "I'm going home."